Add this deluxe robe to your Jedi costume for a complete Star Wars look. The dark brown cloak is made of 100% polyester and features a rough, authentic texture, hood and long sleeves. 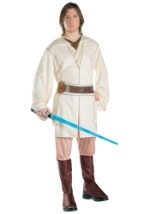 You can give your Jedi costume a more genuine appearance and protect your identity with this deluxe robe.